"Barbara Allen" (Child 84, Roud 54) is a traditional Scottish ballad; it later travelled to America both orally and in print, where it became a popular folk song. Ethnomusicologists Steve Roud and Julia Bishop described it as "far and away the most widely collected song in the English language—equally popular in England, Scotland and Ireland, and with hundreds of versions collected over the years in North America." The ballad generally follows a standard plot, although narrative details vary between versions. A servant asks Barbara Allen to attend on his sick master. She visits the bedside of the heartbroken young man, who pleads for her love. She refuses, claiming that he had slighted her while drinking with friends; he dies soon thereafter. Barbara Allen later hears his funeral bells tolling; stricken with grief, she dies as well. They are buried in the same church, a rose grows from his grave, a briar from hers, the plants form a true lovers' knot. ...but above all, my dear Mrs Knipp whom I sang; and in perfect pleasure I was to hear her sing, and especially her little Scotch song of Barbary Allen. From this, Roud & Bishop have inferred the song was popular at that time. They suggested that it may have been written for stage performance, as Elizabeth Knepp was a professional actress, singer, and dancer. One 1690 broadside of the song was published in London under the title "Barbara Allen's cruelty: or, the young-man's tragedy. With Barbara Allen's [l]amentation for her unkindness to her lover, and her self". Additional printings were common in Britain throughout the eighteenth century. The ballad was first printed in the United States in 1836. Many variations of the song continued to be printed on broadsides in the United States through the 19th and 20th centuries. Throughout New England, it was passed orally and spread by inclusion in songbooks and newspaper columns, along with other popular ballads such as "The Farmer's Curst Wife" and "The Golden Vanity". Several early complete versions of the ballad are extant. 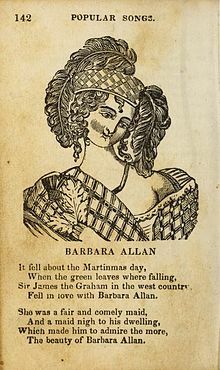 Scottish poet Allan Ramsay published "Bonny Barbara Allen" in his Tea-Table Miscellany published in 1740. Soon after, Thomas Percy published two similar renditions in his 1765 collection Reliques of Ancient English Poetry under the titles "Barbara Allen's Cruelty" and "Sir John Grehme and Barbara Allen". Ethnomusicologist Francis Child compiled these renditions together with several others found in the Roxburghe Ballads to create his A and B standard versions, used by later scholars as a reference. Tho your heart's blood were a spilling. It cry'd, Woe to Barbara Allan! 'O mother, mother make my bed! As with most folk songs, "Barbara Allen" has been published and performed under many different titles. The ballad and its heroine have in conjunction been called "The Ballet of Barbara Allen", "Barbara Allen's Cruelty", "Barbarous Ellen", "Edelin", "Hard Hearted Barbary Ellen", "Sad Ballet Of Little Johnnie Green", "Sir John Graham", "Bonny Barbara Allan", "Barbry Allen" among others. Roger Quilter wrote an arrangement in 1921, dedicated to the noted Irish baritone Frederick Ranalow, who had become famous for his performance as Macheath in The Beggar's Opera at the Lyric Theatre, Hammersmith. Quilter set each verse differently, using countermelodies as undercurrents. An octave B with a bare fifth tolls like a bell in the fourth verse. A short piano interlude before the fifth verse was commented on favourably by Percy Grainger. Quilter later incorporated the setting in his Arnold Book of Old Songs, rededicated to his late nephew Arnold Guy Vivian, and published in 1950. The song often concludes with poetic motif of several stanzas describing symbolising fidelity in love even after death. Standard forms of such motifs are common to several ballads, including "Lord Thomas and Fair Annet", "Lord Lovel", and "Fair Margaret and Sweet William". sung by Hule "Queen" Hines, recorded by John and Ruby Lomax at Florida State Prison, June 4, 1939. One of, if not the, earliest recordings is a 1907 performance by Joseph Taylor, collected on wax cylinder by the musicologist Percy Grainger in 1907. It was digitised by the British Library and made available online in 2018. Charles Seeger edited a collection released by The Library of Congress entitled Versions and Variants of Barbara Allen from the Archive of Folk Song as part of its series Folk Music of the United States. The record compiled 30 versions of the ballad, recorded from 1933 to 1954 in the United States. Baritone vocalist Royal Dadmun released a version in 1922 on Victor Records. The song is credited to the arrangers, Eaton Faning and John Liptrot Hatton. The ballad was covered as a demo version by Simon and Garfunkel on their anthology album The Columbia Studio Recordings (1964-1970) and a bonus track on the 2001 edition of their album Sounds of Silence as "Barbriallen", and by Art Garfunkel alone in 1973 on his album Angel Clare. Angelo Branduardi covered this song as Barbrie Allen resp. Barbriallen on his two music albums Cosi e se mi pare – EP " and Il Rovo e la rosa in Italian. On his French EN FRANÇAIS – BEST OF compilation in 2015 he sang this song in French-adaption written by Carla Bruni. English singer-songwriter Frank Turner often covers the song a cappella during live performances. One rendition is included on the compilation album The Second Three Years. The song has been adapted and retold in numerous non-musical venues. Howard Richardson and William Berney's 1942 stage play Dark of the Moon is based on the ballad, as a reference to the influence of English, Irish and Scottish folktales and songs in Appalachia. It was also retold as a radio drama on the program Suspense, which aired October 20, 1952, and was entitled "The Death of Barbara Allen" with Anne Baxter in the titular role. A British radio play titled Barbara Allen featured Honeysuckle Weeks and Keith Barron; it was written by David Pownall and premiered on BBC Radio 7 on February 16, 2009. ^ Arthur Gribben, ed., The Great Famine and the Irish Diaspora in America, University of Massachusetts Press (March 1, 1999), pg. 112. ^ a b "Late Junction: Never heard of Barbara Allen? The world's most collected ballad has been around for 450 years". BBC Radio 3. Retrieved 2016-02-07. ^ a b Roud, Steve & Julia Bishop (2012). The New Penguin Book of Folk Songs. Penguin. pp. 406–7. ISBN 978-0-141-19461-5. ^ a b Child, Francis James (1965). The English and Scottish Popular Ballads Vol. 2. New York, NY: Dover Publications, Inc. pp. 276–9. ^ a b Coffin, Tristram P. (1950). The British Traditional Ballad in North America. Philadelphia, PA: The American Folklore Society. pp. 87–90. ^ "English Short-title Catalogue, "Barbara Allen's cruelty: or, the young-man's tragedy."". British Library. Retrieved May 8, 2012. ^ Post, Jennifer (2004). Music in Rural New England. Lebanon, NH: University of New Hampshire Press. pp. 27–9. ISBN 1-58465-415-5. ^ Ramsay, Allan (1740). "The tea-table miscellany: or, a collection of choice songs, Scots and English. In four volumes. The tenth edition". Internet Archive. pp. 343–4. Retrieved 17 February 2016. ^ Percy, Thomas (1 December 2018). "Reliques of Ancient English Poetry: Consisting of Old Heroic Ballads, Songs, and Other Pieces of Our Earlier Poets; Together with Some Few of Later Date". F.C. and J. Rivington – via Google Books. ^ "The Ballad of Barbara Allen by Anonymous". PoetryFoundation.org. Retrieved June 12, 2013. ^ "Bonny Barbara Allan, Traditional Ballads, English Poetry I: from Chaucer to Gray". Bartleby.com. Retrieved June 12, 2013. ^ a b Coffin, Tristram P. (1950). The British Traditional Ballad in North America. Philadelphia: The American Folklore Society. pp. 76–9, 87–90, . ^ Sauer, Michelle (2008). "The Facts on File Companion to British Poetry Before 1600". Infobase Publishing. p. 72. Retrieved 17 February 2016. ^ Keefer, Jane (2011). "Barbara/Barbry Allen". Ibiblio. Retrieved January 16, 2013. ^ Langfield, Valerie (1 December 2018). "Roger Quilter: His Life and Music". Boydell Press – via Google Books. ^ Web(UK), Music on the. "Roger QUILTER Folk-songs and Part-songs NAXOS 8.557495 [AO]: Classical CD Reviews- June 2005 MusicWeb-International". www.musicweb-international.com. ^ Würzbach, Natascha; Simone M. Salz (1995). Motif Index of the Child Corpus: The English and Scottish Popular Ballad. Gayna Walls (trans.). Berlin and New York: Walter de Gruyter. pp. 25, 57. ISBN 3-11-014290-2. ^ "Percy Grainger's collection of ethnographic wax cylinders". British Library. 20 February 2018. Retrieved 22 February 2018. ^ a b "Percy Grainger ethnographic wax cylinders - World and traditional music". British Library. Retrieved 22 February 2018. ^ Wilentz 1938, p. 14-15. ^ "Versions and Variants of the Tunes of "Barbara Allen"" (PDF). ^ "Browse All Recordings | Barbara Allen, Take 4 (1922-04-05) | National Jukebox". Loc.gov. 1922-04-05. Retrieved 2016-02-06. ^ "The Columbia Studio Recordings (1964-1970) - The Official Simon & Garfunkel Site". Simonandgarfunkel.com. Retrieved 2016-02-06. ^ "Angelo Branduardi - Cosi È Se Mi Pare". Angelobranduardi.it. Retrieved 2016-02-06. ^ Michele Laurent. "IL ROVO E LA ROSA Angelo Branduardi". Angelobranduardi.it. Retrieved 2016-02-06. ^ "En français - Best Of - Angelo Branduardi". Wmgartists.com. Retrieved 2016-02-06. ^ "Angelo Branduardi – Best Of En Français (CD, Compilation)". ^ "The Second Three Years | Frank Turner". frank-turner.com. Retrieved 29 November 2018. ^ "Barabara Allen by David Pownall". Radio Drama Reviews.com. Archived from the original on December 26, 2012. Retrieved June 11, 2013. ^ "David Pownall - Barbara Allen broadcast history". BBC Online. Retrieved June 11, 2013. ^ An episode of the PBS TV series The American Short Story. A full version of the song is performed in this adaptation of an Ambrose Bierce story of the American Civil War. ^ "Travolta Sings For 'Bobby Long'". Billboard. 2004-12-29. Retrieved 2016-02-06.